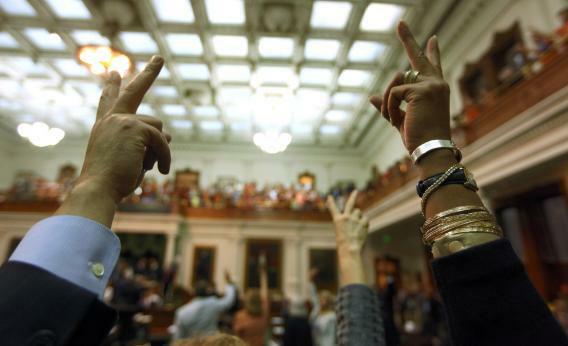 Texas abortion bill will get another vote. Did Wendy Davis fans celebrate too soon? Texas Abortion Bill Will Pass, so What Did Wendy Davis Actually Accomplish? Did pro-choice Texans win anything? 1) National attention for a story Republicans hoped would be buried. The whole point of putting the abortion bill in the special session was so that Republicans in the state, particularly the ambitious Dewhurst, could pander to the religious right without catching too much heat from the national media or the libertarian branch of Texas Republicans who think all this abortion stuff is a waste of time. Any hopes they could slip this one in under the radar are gone. 2) Terminating Perry’s plausible deniability. Special sessions are only to be called for emergency situations. Ostensibly, the first one was: It was called to deal with redistricting and transportation issues, and the abortion bill was offered as a “while you’re here, might as well” kind of thing. Now there’s no hiding, and Perry needs to explain why ending most safe, legal abortions in his state is an emergency situation, despite Texas having rolled along just fine for the past 40 years. 3) Reinvigorating the Texas left. As I mentioned in another post, Texas is actually a white minority state and, in the eyes of many Texas Democrats, should be much bluer than it is. One reason it’s not is malaise; Democratic-leaning minorities in Texas often don’t bother to vote or even register because they don’t really think their vote will make an impact. Democrats hope that this will remind Texas liberals they’re not alone, which could improve voter turnout. 4) Shoring up the legal case against the bill. While the 20-week ban in the bill was justified under the scientifically incorrect theory that fetuses feel pain at that gestational age, the rest of the bill—the part that will shut down 37 clinics—was rationalized disingenuously as a regulation to protect women’s health. (As in, we need all these clinics to meet the same standards as hospital-style surgical centers to protect women’s health.) However, in all the frustration over losing, prominent politicians let the façade slip in public. Dewhurst went on record claiming the bill was about “protecting unborn babies.” That quote is definitely going to come up when reproductive rights groups sue and argue that the regulations are about stopping abortion and not about protecting women’s health. 5) Turning Wendy Davis into a national superstar. As Josh Voorhees notes, this will definitely help Davis, who has been the target of redistricting schemes, in her bid for re-election. Now she can dream bigger than that, perhaps even eyeing a move to Washington. Pro-choicers certainly didn’t start off trying to give Davis a national platform, but if this helps her out while also embarrassing Rick Perry, they’ll take it. In the short term, Texas pro-choicers know they’ve absolutely lost this battle. Eventually, the Republicans will make safe, legal abortion a fantasy for huge swaths of women who need the service in the state. Still, that doesn’t mean the activists failed. If there’s any chance of winning in the long run, the seeds were planted in this week’s drama. And hell, maybe some other Dem will lace up the sneakers and filibuster this special session, too.